Here at LetSleepHappen we are passionate about helping you with your sleep. We provide information and services, with the expertise of sleep psychologist Rosemary Clancy, to give you practical solutions to help you sleep better. 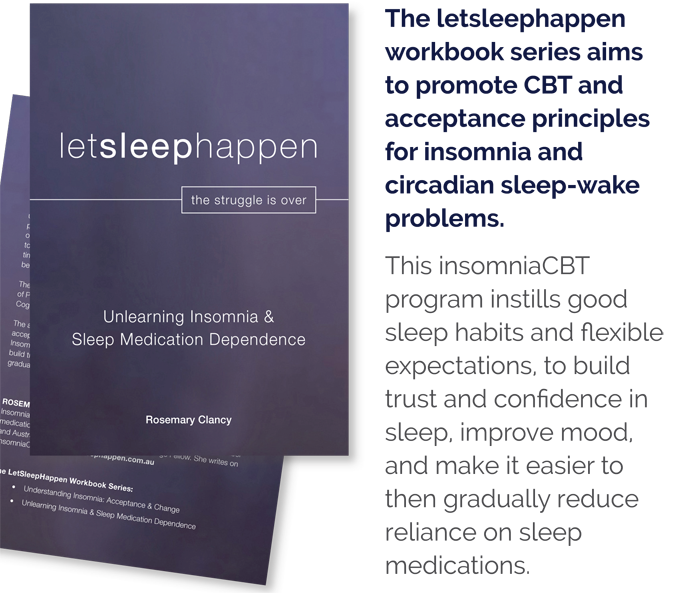 Disclaimer: This "Unlearning Insomnia & Sleep Medication Dependence" workbook is a learning and awareness tool for Insomnia sufferers who may be dependent on prescription sleep medications. It is not a substitute for contracting with a prescribing medical practitioner who can provide medical supervision of medication reduction. The author is not responsible for any loss, liability, damage or injury suffered or incurred by any person in connection with the information contained in this workbook, or by anyone who receives & acts on advice from a reader of this workbook. Sleep is an important part of your daily routine — you spend about 1/3 of your time doing it. Quality sleep – and getting enough of it at the right times is as essential to survival as food and water. Without sleep you can’t form or maintain the pathways in your brain that let you learn and create new memories, and it’s harder to concentrate and respond quickly. During the night we move in and out of sleep stages in approximately 60-90 minute cycles, interspersed with waking. (as below, table cited from CRUFAD). The first sleep cycles each night feature more deep sleep, in response to homeostatic drive build-up during the day, and less REM sleep. As the night progresses, time spent in deep sleep decreases as REM sleep periods increase. By morning, people will more likely wake from light sleep or REM sleep. REM or rapid-eye-movement sleep: is otherwise known as dream sleep, featuring electrical activation of the brain, low muscle tone and immobile limbs, and rapid eye movements with the eyes darting around under closed eyelids. REM sleep provides energy to the brain and body and supports daytime performance. Dreams often occur during REM sleep, although they can occur at any stage. Stage 2: the onset of sleep, when one becomes disengaged from the environment. Body temperature drops and breathing and heart rate become regular. Stages 3 & 4: the deepest, most restorative sleep, in stage 4 especially characterised by the brain’s 'delta' ­waves, like ocean swells compared to the “choppy” brain waves of lighter sleep. In these stages blood pressure drops, breathing becomes slower, muscles relax and receive more blood supply, organ and muscle tissue growth and repair occurs, and human growth hormone is released. People are difficult to wake during stages 3 and 4. There is no eye movement or muscle activity. If you are awoken during deep sleep you will experience quite severe “sleep inertia”, ie you will feel groggy, disoriented and “woolly-headed” for several minutes. Some children experience bedwetting, night terrors, or sleepwalking during deep sleep. These are physical, mental and behaviour changes that occur in a 24-hr cycle, in response to light and dark in our environment.. When sun hits your retina in the morning, even through closed eyelids, the light travels from your retina to your SCN, or suprachiasmatic nucleus. The SCN sends messages to the brain and body starting up all your body’s activation processes (ie increased heart rate, blood pressure, body temperature, metabolic rate, increased attention and response rate). Homeostatic drive is like hunger (the longer between meals, the hungrier you get), ie in relation to sleep, the longer you are deprived of sleep, the more your need to sleep grows. These drives work together, so that if you have very few hours sleep or miss a night’s sleep, you can trust that your homeostatic drive will build over the lost sleep time, and you will sleep better the next night, as long as you stay awake during the day. Feeling drowsy after lunch and not giving into the urge to sleep is normal. How do I get more deep sleep? First, it’s worth understanding that slow-wave sleep is under the control of your homeostatic drive (ie, like hunger, pressure to sleep increases the longer you go without sleep). So provided you’ve been awake during the day, building up “drive” to sleep, your brain will self-regulate to make sure your deep sleep need is met in the first half of your night’s sleep. You don’t have to do anything to make this happen. Same if you nap during the afternoon, after 20-30 minutes your brain will go into slow wave or deep sleep and start dissipating your pressure to sleep. The problem only happens when people (especially in depression) misinterpret tiredness and fatigue for need to sleep, and get into a habit of sleeping on and off during the day for a few hours at a time, then also wanting to sleep all night. The brain doesn’t get the chance to build up enough pressure to sleep at night because there’s too little waking time. This is why it’s best to cut out the afternoon naps, and build up enough pressure to sleep at night. I go on social media at night when I can’t sleep, to stop my mind racing. Is this bad? First, it’s true there are some reasons why electronic devices can obstruct your sleep. Physiologically, the melanopsin photoreceptor in your eyes is sensitive to the blue light wavelength from your screen which suppresses Melatonin sleep hormone. Attentionally, your orientation response keeps firing at the regular information/page refreshes available on social media. Cognitively, the random pace of social media posting can fire your brain’s reward pathways in the same way as cocaine, and the information content can seem meaningful and valuable, so hard to turn away from. Emotionally, sharing information on social media can create a rush of positive emotions like excitement and joy that you want more. Just looking up stuff can excite your curiosity and increase your sense of mastery and (Information is Power! ), which feels compelling if other things in your life feel out of control. Try to be understanding about your need for social media though. If it’s difficult to wean yourself off games or social media, remember that blaming yourself for doing something “bad” won’t help you get off it. It will just increase performance pressure on yourself to sleep without being pragmatic about the basic uncertainty of sleep onset. Experiencing tiredness during the day? Is it due to poor sleep? Start by considering the difference between being “tired and wired” (signs of chronic insomnia) and sleepy (a sign of the objectively poor sleep quality in obstructive sleep apnoea, where the brain wakes someone even from deep sleep, to force them to breathe). You may be tired or even exhausted during the day, for a range of reasons, but not in the least sleepy. You know there’s a difference between tired and sleepy at night when you feel exhausted but are still not sleepy. Medical conditions: iron deficiency; infectious diseases like glandular fever; immune disorders like Crohn’s disease or MS; ulcerative colitis; food allergies; coeliac disease; CFS/ fibromyalgia; blood disorders; heart and lung disease; COPD; restless legs; diabetes; sleep apnoea; medication side effects (especially heart, blood pressure, and pain medications). This is not to make you more fearful or hypervigilant, but merely to start getting a balanced view of fatigue causes if you tend to only attribute your tiredness to sleep problems. What should I get help for? Low mood in the morning (may lift in the afternoon), poor concentration, fatigue, loss of interest, pleasure & motivation, increasing self-criticism, isolation and social withdrawal, feelings of hopelessness, even suicidality. See your GP if this has gone on for several weeks as these are signs of a depressive disorder. Missing several nights’ sleep in a row, or missing many hours sleep each night, so that your mood becomes elevated, with increasing energy, irritability, talkativeness, distractibility, agitation, anxiety and racing thoughts. See your GP as this could be a sign of bipolar mood disorder. Waking up during the night habitually, and unable to return to sleep because of chronic conditioned worry. Waking up unrefreshed most days with a headache, dry mouth, and your partner saying you’re snoring. You’re unintentionally falling asleep when sedentary throughout the day. Even if you’re not overweight, ask your GP about sleep study, as this could be Obstructive Sleep Apnoea. Your sleep is broken by restless leg movements, which are only improved by moving and walking around. Having a delayed sleep-wake cycle (eg sleeping from 3am – 11am daily) or not having a regular sleep wake cycle, eg waking at 9am some days, then midday or later other days, and not being able to fall asleep when you want to at night. If this is happening every day, or most weekends. You feel drowsy at work all the time, and are perhaps losing work or work opportunities because of this. Waking up 4-5 times during the night to pee, especially in your 20s and 30s. You could use some help with this if you’re losing confidence in your bladder capacity. Waking up in a sweat with (peri)menopausal hot flushes early in the night and feeling tired and drowsy during the day. Sleep restriction therapy: curtailing time in bed to the actual hours of sleep, to increase sleep efficiency (ie getting the most sleep out of your time in bed). Relaxation training: exercises to reduce muscle tension, central nervous system activation and racing thoughts which can get in the way of sleep. Sleep hygiene education: guidelines about lifestyle change (eg diet, exercise, alcohol/substance use) and bed environment change (light, noise, temperature) that can help improve sleep. Also information about what’s normal in sleep, and how sleep changes with age. Sleep diary: the act of completing a sleep diary not only promises better understanding of your sleeping patterns, but in itself motivates change in behaviours leading to better sleep, in the same way that completing a food diary motivates change in eating habits. It yields much (often reassuring) information that leads to an individual sleep plan targeting your insomnia causes. You wont have to do it forever – in the long term we’d like you to ignore your sleep like good sleepers do – but just long enough to learn new skills and see them working. Click here for the sleep diary. Mindfulness therapy is about learning to be aware of, and pay attention to, unfolding experience in the present moment. It’s about purposefully experiencing and observing your thoughts, feelings and sensations with curiosity, without reacting to them or trying to avoid or suppress them. Mindfulness therapy is used in managing worry and rumination cycles and hypervigilance that condition an association between bed and waking. Acceptance and Commitment Therapy (ACT) focuses on mindfulness, acceptance and values, helping promote acceptance of your unfolding experience, even unpleasant or distressing thoughts, feelings and sensations, while moving towards meaningful goals. The primary goal of ACT is to live a meaningful and fulfilling life, while accepting the unavoidable pain that comes with it. This happens when mindfulness is used to promote acceptance of one’s experience, detached observing and describing of thoughts without being “fused” with them, being in contact with the present moment; and reviewing one’s core values in life, then using these to take committed action towards meaningful goals that align with core values. Insomnia symptom-reduction is not an immediate goal of ACT because attempts to control and get rid of insomnia actually worsen distress and insomnia. However, research evidence shows that the unexpected side-effect of acceptance practice is simultaneous insomnia reduction. These treatment strategies work not only for sleep problems, but for associated anxiety and low mood that accompany insomnia and sleep-wake disorders. Eligible sleep, mood and anxiety treatment clients can receive a rebate from their Health fund, or from Medicare under the Better Access Scheme (up to 10 individual sessions in a calendar year, under a Mental Health Care Plan, and with a referral letter, from your GP or psychiatrist). Please contact Sydney Sleep Centre on (02) 9252 6144 for information on fees and Medicare requirements. LetSleepHappen submitted sleep medication accidental overdose data to the Australian Federal Sleep Health Awareness Inquiry on 11/2/19. Investigating the psychology of accidental overdose is crucial given the hundreds of Australians unknowingly combining lethal levels of prescription sedatives every year, in a bid to sleep and quell anxiety or chronic pain. Can insomnia's noise sensitivity be helped by tinnitus "Sound Enrichment" treatment? Effective CBT insomnia help prevents mental health issues in athletes, just like everyone else. Sleep meds, not so much.